AIT TEACHING IS GOING ON THE NET!! And AIT Teacher Training is not the only kind of AIT teaching that’s going on the Net. Beginning this winter, we are developing a 2-tiered teaching program. The first tier, “Live and Local,” will have AIT teachers teaching AIT seminars in hubs such as Atlanta or London, like we’ve always done (In AIT, a hub is a geographical location, like Boston or Beijing, where at least one AIT teacher is teaching AIT seminars live and in person.). Many practitioners prefer live learning. However, we can’t create hubs in rural areas like Truth Or Consequences, NM, for example, or Bloomington, Indiana because there aren’t enough potential practitioners in these smaller locations to support a hub. And some potential hubs are so far away—I’ve had requests for training from Australia, New Zealand, South Africa, India, and Malaysia, for example—that traveling to them to teach would be too expensive and take too much time. So, we’ve decided to do the obvious: Film all the AIT seminars and put them on the website as interactive webinars. Potential participants will be screened to make sure they are qualified to take the seminars. With this 2-tier teaching system, more people will be able to get AIT training than ever before, and at less cost to them. They’ll no longer have to travel to the nearest hub which may be 1,000 miles away, and they’ll no longer have to pay for travel, hotel, and restaurants, which often more than doubles their expenses. I’ll have more news about the AIT Internet Seminars in the coming months. We’re hoping to air the first-ever MAP on the Net in February. 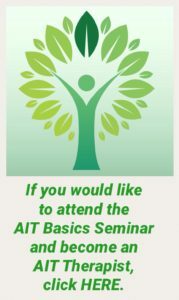 One more thing, in case you haven’t heard: We are opening AIT Basics training to all healing professionals, from energy healers to MDs. Because of the development of the Multicausal Illness Treatment and the Cancer Prevention and Treatment work, we have peaked the interest of a number of Functional MDs. These are alternative MD’s who have known for years that some of the causes of their patients’ illnesses are psychological or spiritual but have not known how to treat these causes. Because of their increasing interest, I have developed a new program which will teach these doctors—and other healing professionals who aren’t psychotherapists—how to treat illness in the AIT way. I hope you can tell from this first issue of AIT NEWS that the Board and I are filled with the energy of new ideas and directions, and are already working to implement them! We are more than ready to bring AIT into the future. If you would like to help us do this, please contact me at ashaclinton@gmail.com. Let’s Talk! More news next month. Meanwhile, please check the seminar schedule on this website to see where and when you can learn more AIT.